News 10 April, 2019 . Written by Peter Dunne . In light of recent events with Brunei introducing the death sentence for LGBT+ people, Senator Fintan Warfield, the Sinn Féin spokesperson on LGBT+ rights, has written to An Taoiseach expressing his opposition to the Attorney General, Seamus Woulfe, attending an upcoming event held in The Dorchester Hotel. The London venue, which is owned by the Sultan of Brunei, has recently attracted protests from those horrified by the country’s introduction of Sharia laws which not only include death by stoning for LGBT+ people, but also punish adultery by flogging. Senator Warfield opposed the news that the Attorney General would attend the Annual Meeting of the International Academy of Trial Lawyers held between April 10 and 14. In a statement, Senator Warfield said: “In response to Deputies Sean Crowe and Donnchadh Ó Laoghaire in the Dáil today, Tánaiste Simon Coveney confirmed that the Attorney General has been invited to attend an event at the Dorchester Hotel over the coming days. 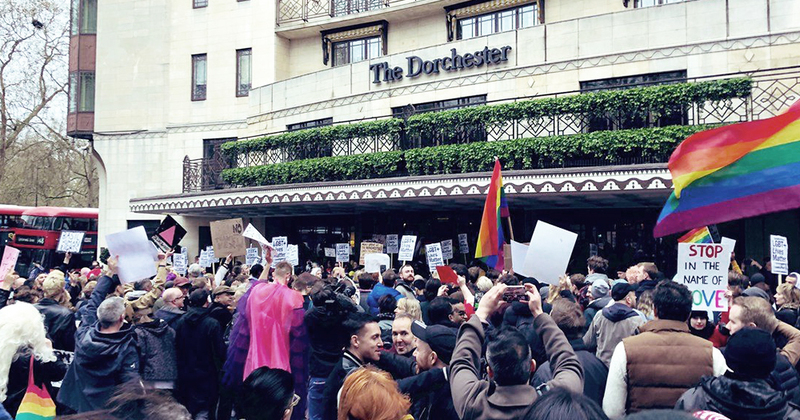 The Dorchester Hotel is a business owned by the Sultan of Brunei. Brunei is a State where homosexuality is illegal. The Sultan of Brunei has absolute control in the country and has recently announced that barbaric new capital punishment laws will be introduced, including death by stoning or flogging of LGBT people. Since the new laws were enacted, Brunei has faced considerable backlash from the European Union and Amnesty International. A number of MPs in the UK have called for Brunei to be removed from the Commonwealth. 10 April, 2019 . Written by Peter Dunne .